Yesterday, PM Jacinda Ardern committed this country to an extension of our military deployments in Iraq and Afghanistan, pending a review early next year of what their future purpose might be. Changes in those roles, Ardern strongly hinted, were likely. Since then, the politics of this decision have degenerated into a slanging match about whether the previous National government was right or wrong to make the initial commitment to Iraq – and whether the extension is a responsible thing given our joint training role in Iraq with Australia, or is hypocritical in the light of prior statements made by a previous Labour leader etc. etc. etc. As usual, the benefit – or otherwise – of our military presence to the people on the receiving end has barely had a look in. It’s all about us. Oh, Ardern did make the rote claim that “the New Zealand Defence Force has made a significant contribution to peace and stability in Afghanistan since 2001”. Well, she would say that. But as she also said, our forces have now been in Afghanistan for nearly 20 years. Those deployments have come in all shapes and sizes: from SAS special force units formerly deployed in Kandahar and Kabul, to the 240-strong provincial reconstruction team (PRT) formerly based in Bamiyan province, to the current 11 office personnel based at NATO headquarters. Has anything at all about our Afghan commitment really been of “significant” value to its people? (Leave aside the harm done, as detailed in the book Hit & Run.) If “significant” means “lasting” then the answer would have to be “No”. Because any credible assessment of the SAS and PRT roles would conclude that those efforts have made no lasting contribution whatsoever either to the security of Afghanistan, or to its regional development. Therefore, before Ardern and her coalition colleagues make any further decisions on the future of our deployments in Iraq and Afghanistan, they need to be upfront about what tangible results they think we can deliver, given the current state of affairs in both those countries. Regional development or aid and development reconstruction in Afghanistan is no longer possible. As this recent report in Foreign Policy magazine makes clear, NATO forces and the US have now essentially retreated into merely defending the main cities. As a result, the Taliban have become the de facto rulers and administrators of much of the Afghan countryside – and even major provincial towns and cities are no longer safe from attack. Interestingly though, the Taliban have (since 2009) reportedly adopted a different approach to their previous scorched-earth policy of killing teachers and destroying aid projects. Instead, they now prefer to take over the aid projects and run them themselves, as part of a wider strategy to win over the rural populations, and prove that they can be a responsible, uncorrupt and competent alternative government. In other words, aid and reconstruction in Afghanistan – as being mooted by the Greens – would, if carried out anywhere beyond Kabul, become an aid project administered by the Taliban, and would be co-opted into their ongoing “hearts and minds” programme. Which is not to say that such aid wouldn’t be worthwhile – but we shouldn’t keep kidding ourselves that our aid contributions (and NATO’s military efforts) are offering a viable alternative to the Taliban. The Taliban have all but won this war, and our past efforts to provide an alternative to them have been in vain. If we persist in this commitment, our efforts need to recognize that reality. Afghan footnote: As for Bamiyan, the site of our previous PRT aid and reconstruction effort… the news is almost entirely bad. Bamiyan is being badly hit by drought, by rising rates of drug addiction, by a decline in education and rising illiteracy, and by a declining security situation that is creating more displaced families within the province, and is choking off the province’s once-promising tourism industry. Even in Bamiyan, aid projects in future would only be at the grace and favour of the Taliban. 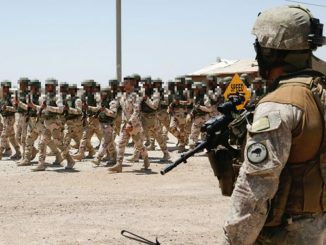 Some 142 troops are currently deployed as co-trainers alongside the Australians at Camp Taji in Iraq, and this will shortly decline to 121 trainers, with the phase-out of this role set for mid 2019. That’s unless the training role gets renewed by the coalition government, and/or unless our military purpose is re-defined. According to Ardern, we’ve trained about 37,000 cadets directly thus far, and are moving to a role whereby we train the Iraqi Army trainers. Changes have occurred in the country. In the years since our initial military commitment to Iraq was made, Islamic State has been driven from Iraqi cities (Mosul, Ramadi) and from the territories it once held. However, Islamic State’s reversion to being a guerrilla force could – ironically – make a case for the deployment of SAS troops, when our Iraqi commitment gets reviewed. That would be only if combatting Islamic State on the ground was the real aim of the deployment – and not say, the diplomatic goals of currying favour with our traditional allies in Washington and Canberra. Some things do not change, though. When our military deployment in Iraq began, Iraq didn’t have a functioning central government; and it still doesn’t. Four months after the last election, the government in Baghdad is still split. Last week though, progress was made in uniting the hitherto divided Shia parties in the choosing of a parliamentary Speaker and deputy Speaker, in an outcome reportedly brokered by the legendary Iranian fixer and tactician, Qassem Soleimani. Meanwhile in the south of the country – in Basra and beyond– huge and violent protests have been occurring against government corruption and the failure to provide basic public services, such as safe drinking water. It is a highly unstable situation. Somehow, we have troops in Iraq helping the US to prop up a puppet regime that is being run by Iran – even though our exporters are simultaneously being ordered by the US to scrap our lucrative trade with Iran, under pain of American sanctions if we persist. In other words, we can send our military to support Iran’s puppets for their benefit, but we can’t trade with Iran for our benefit. That situation seems to be utterly bizarre. Footnote Iraq: Of course, there any number of aid and development needs in Iraq. As the Basra riots indicate, the country badly needs water projects that actually work. Also… the plight of the Yazidis – whose suffering galvanized the world’s attention at the height of Islamic State’s butchery four years ago – has now been all but forgotten by the West. There’s an opportunity here, surely. If the Greens can’t convince Defence Minister Ron Mark to transform the military presence in Iraq into a reconstruction effort, maybe there could be a trade-off arranged with NZF – one in which the Yazidis would be made a priority of an increase in our refugee quota. While we try to figure out a coherent defence strategy, it’s probably worth trying to win friends and allies in places where those decisions have traditionally been made: namely, in Washington. Here’s the Jon Spencer Blues Explosion with a 1993 song that seems pretty appropriate for the man currently in the White House.